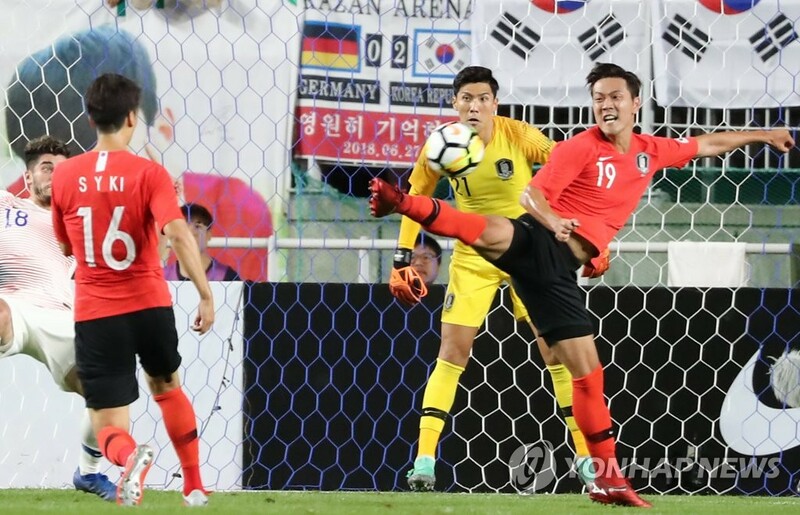 BRISBANE, Australia, Nov. 16 (Yonhap) — For South Korean center back Kim Young-gwon, national football team captaincy isn’t always a welcoming job. But he is now tasked to lead the players on the pitch when South Korea play their upcoming friendly matches in Brisbane, Australia. Kim was named South Korea’s captain for the November friendly matches that are considered tune-ups for the 2019 Asian Football Confederation (AFC) Asian Cup. The Taeguk Warriors are scheduled to face Australia on Saturday and take on Uzbekistan three days later. “The national team captaincy is a difficult, lonely and high-pressure job,” Kim said to reporters at Perry Park in Brisbane ahead of team training on Thursday. This isn’t the first time that Kim has been named the national team captain. But his recent memory with the national team captaincy isn’t really a beautiful one. Kim was selected as the team captain in August 2017 by then head coach Shin Tae-yong for South Korea’s last two matches in the final Asian qualifying round for the 2018 FIFA World Cup. But Kim was criticized by fans for his controversial remarks after South Korea’s World Cup qualifier against Iran at home which ended in a 0-0 draw. He said the players couldn’t really communicate on the pitch because of fans’ loud shouting from the stands, which angered many South Koreans. Kim went on to serve as the team captain for South Korea’s next match against Uzbekistan, but was already a public enemy of South Korean football fans. Without the captaincy, Kim transformed himself from ugly duckling to hero at the 2018 World Cup in Russia. With his inspiring performance on the pitch and an opening goal against Germany in South Korea’s 2-0 win, Kim suddenly became a fan favorite. Now, given another chance to lead the players on the pitch, Kim said he understands his responsibility and what he needs to do. And he knows it’s not going to be an easy job since some core players are left out. For the November friendlies, Kim will wear the captain’s armband in the absence of Son Heung-min, who has been serving as a team captain under new head coach Paulo Bento. Son was unselected for the November friendlies following an agreement between his English Premier League club Tottenham Hotspur and the Korea Football Association (KFA). Newcastle United midfielder Ki Sung-yueng, who was a long-time captain for South Korea before Son, is also absent as Bento decided to give the veteran a rest. Kim, 28, has been one of Bento’s first-choice center backs since the Portuguese took over the helm in August. The Guangzhou Evergrande center back has three goals in 60 caps, the most among defenders selected for the November friendlies. But there are concerns about his recent form as he became a forgotten man at his Chinese club. Kim is currently playing with a reserve team at Guangzhou. “Of course, playing a match for the first-team will be better, but I’m training hard at the reserve team to have a good form,” Kim said.